And so it was at 1,400 feet above sea level from the mountain ledge of Storsteinen overlooking Tromsø Sound. 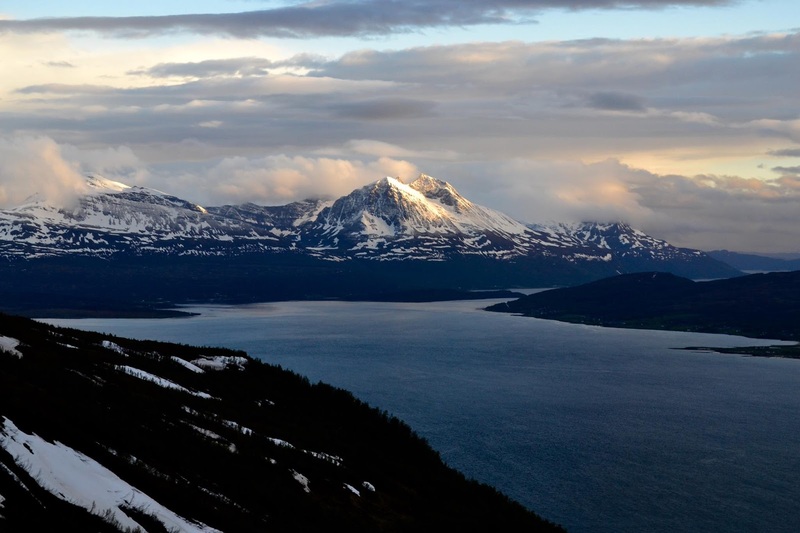 Adventure beyond the Arctic Circle begins here! All photography unless noted is the property of EuroTravelogue™. Unauthorized use is prohibited. Friluftsliv (free-loofts-leave), the Norwegian word for being outdoors and experiencing nature, and as often as possible; is a philosophy embraced by Norwegians and an essential way of life in this Scandinavian country. Recently, a colleague reminded me of a quote by Ralph Waldo Emerson, "Live in the sunshine, swim the sea, drink the wild air." Combined, these philosophies embody the richness, the diversity, the adventure—all that is Northern Norway. 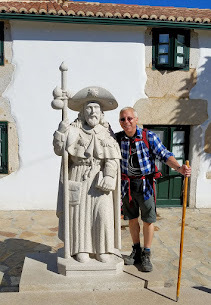 Until now, I never really thought of myself as an adventure traveler or explorer per se, but as I came to find out, each new day ignited a spark followed by an adrenaline surge that left me begging for more! 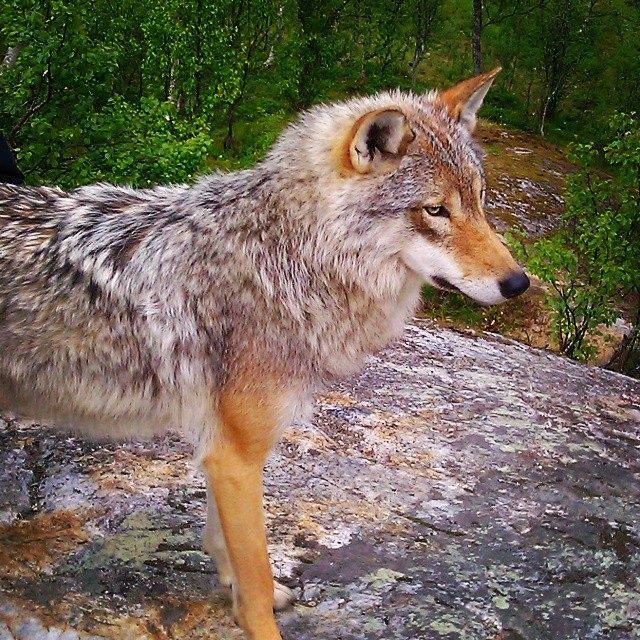 From skimming the waves on a RIB boat safari and kayaking in the fjords to encounters in the wilderness and even a French kiss with a wolf, northern Norway was made for adventurers, explorers! Beautiful Norway as seen aboard the ferry from Gryllefjord to Andenes. While I've toured the rugged southwestern coast of Norway's majestic fjords, I have never explored above the Arctic Circle until the indomitable call of the midnight sun beckoned with the promise of towering peaks plunging into endless seas and sheltered bays shimmering under the unrelenting summer sun that never sets despite the hour. 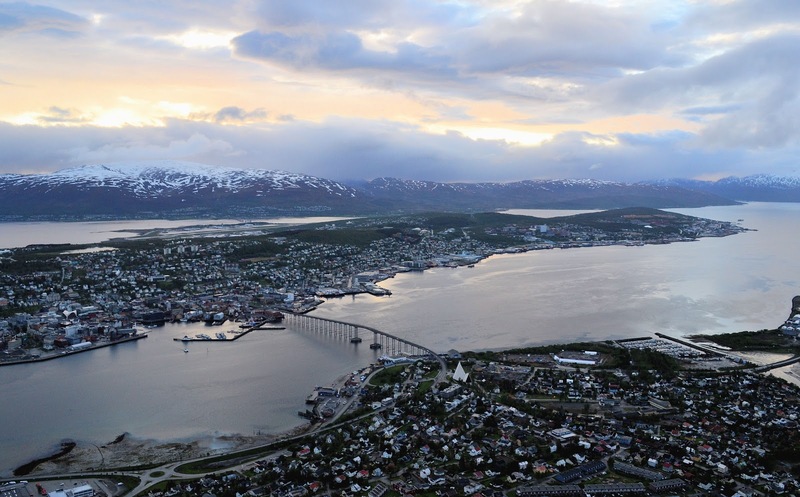 Tromsø Sound and city as seen from high atop the mountain ledge of Storsteinen at 10:30 p.m.
"Welcome to Tromsø," the captain announced and I thought to myself, the Arctic Circle? Wow! And while I may not be Roald Amundsen, the Norwegian explorer who discovered the South Pole in 1911; or Dr. Frederick A. Cook who discovered the North Pole in 1908; a sense of wonder, excitement emerged and my inner explorer was ready to embark on this Arctic expedition! As we exited the plane, I wasn't sure if it was anticipation or anxiety surging within, but I knew from the Arctic kiss on the cheek, I was here and my polar adventure would forever change the man I was. Have you found your inner explorer? We began our Arctic expedition chasing the midnight sun high above Tromsø aboard the Fjellheisen cable car and while the rain drops drizzled and blurred our view as we soared higher and higher, the clouds parted suddenly once we reached the top and we ran as fast as we could from our mountain perch to the edge of the cliff. There in the distance, golden sunlight kissed the Alpine peaks looming on the horizon. All I could think about was "And God said, 'let there be light.'" And so there was! On board and anxiously awaiting our skippers to get underway on our sea safari on Senja, Norway's second largest island not including Svalbard. Photo: Gøril Vicki Ovesen. Unauthorized use is prohibited. Now that we've conquered the midnight sun, our expedition was underway! Due to the rough conditions in the North Sea, our whale safari was canceled when we arrived on Norway's second largest island Senja, so we opted for the next best thing—a nature safari through the Bergsfjord to meet the natives. Our handsome sea captains, Lasse and Luis piloted our voyage and introduced us to the denizens of the fjord. As we cruised past aquamarine pools glistening in the sunshine, I had to remind myself that I was not in the Caribbean. Slowing down to capture the splendor of Norway. 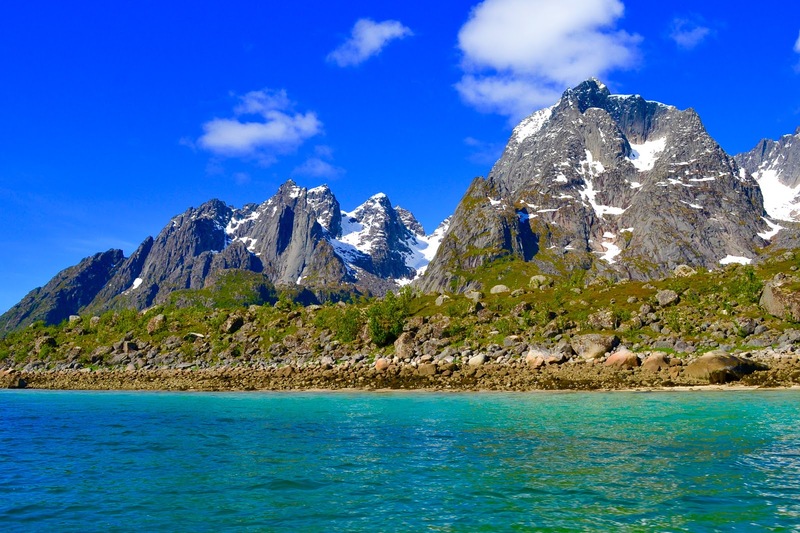 Pristine waters of glistening aquamarine shimmered in the Norwegian sun. Suddenly, the wildlife came out to greet us. 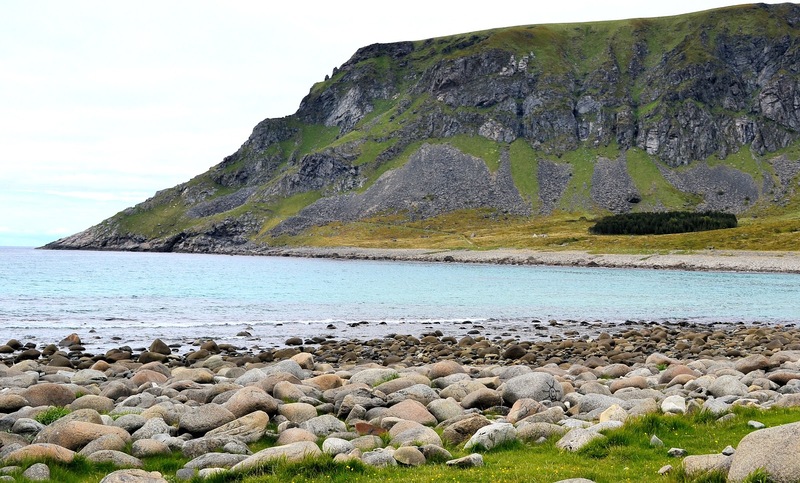 As we sailed along, we stopped to visit the flocks of Cormorants clinging to the rocky crags of the coastline; eagles swooped from soaring heights to scoop up fish from the sea, with a little help from our captains; and seals bounced along the rocky islets just before their watery plunges. 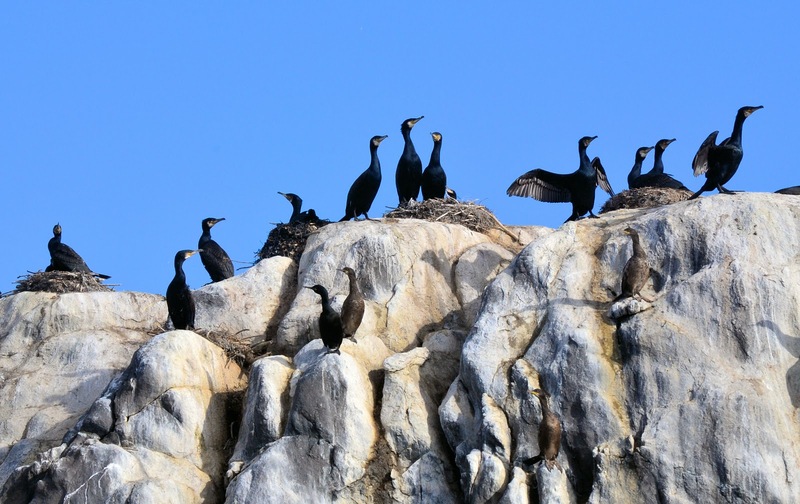 Flocks of cormorants cling to the craggy coastline, some drying their wings, others protecting their nests. 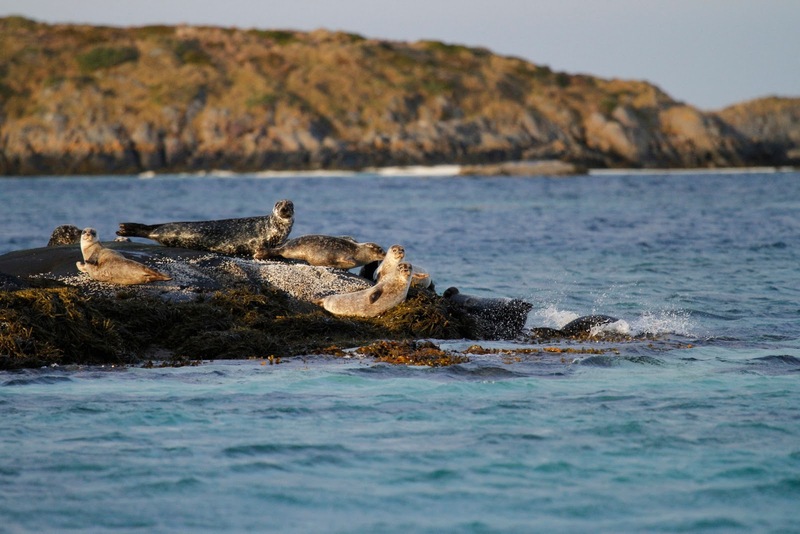 Seals bounce along the rocky outcrops in the Bergsfjord. Photo: © Einar Veimoen, Nordnorge.com, Bjarkoey. Unauthorized use is prohibited. 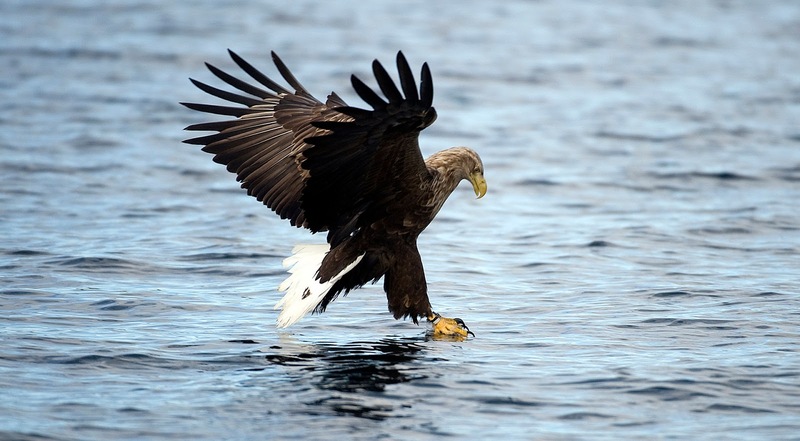 Using a little fish bait, our captains coaxed the eagles to swoop down upon their prey. Photo: © Marten Bril, VisitVesteralen.com, Andoey, Boe, Hadsel, Loedingen, Sortland, ksnes. 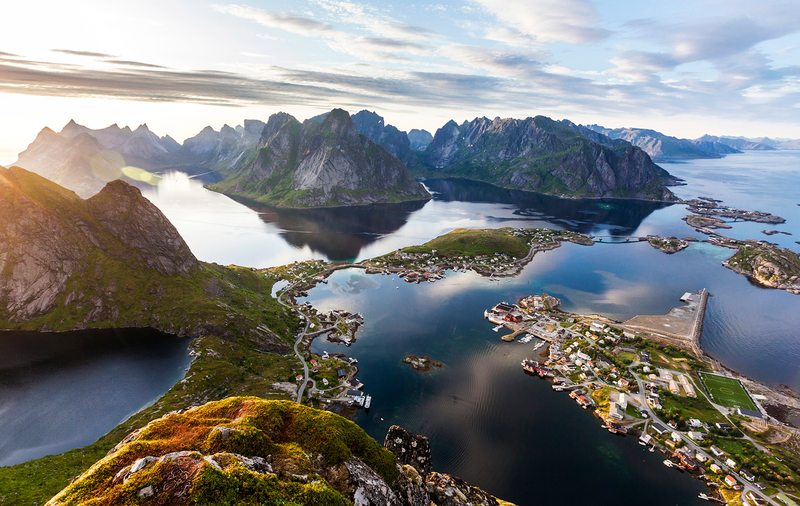 Undoubtedly one of the most beautiful and photographed regions of Norway, the Lofoten Islands lie 60 miles above the Arctic Circle and comprise a 70-mile-long archipelago with seven principle islands stretching from north to south: Austvågøy, Gimsøy, Vestvagøy, Flakstadøy, Moskenesøy, Værøy and Røst; the first five are connected via the scenic E10 route while the last two can only be reached by ferry. 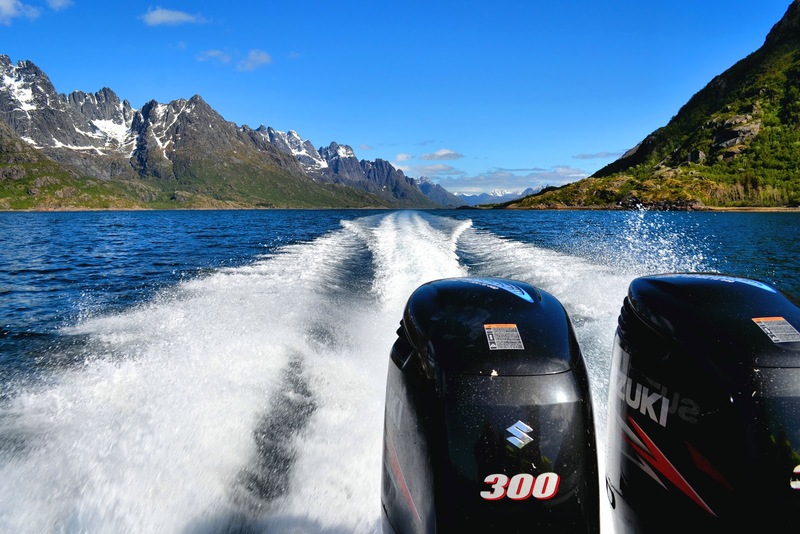 Heart-pounding thrills on board our RIB Safari through the Trollfjord. 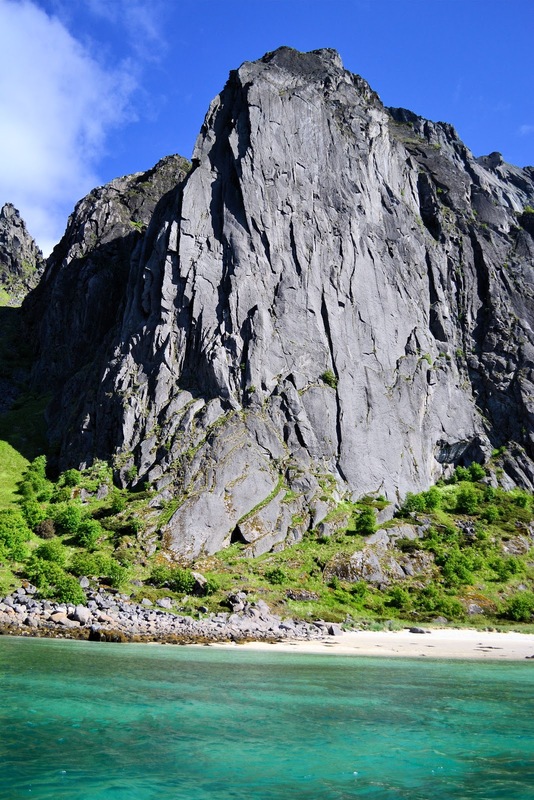 Exhilarating, envigorating, heart-pounding are but a few words that come to mind as we zipped along, skimming the waves of the Trollfjord in Svolvær with our friends at Rib-Lofoten. After donning our full-body dry suits, we jumped into our RIB (rigid inflatable boat) and straddled our jockey seats preparing for the race. At first glance, I didn't think the seats looked very comfortable but I soon discovered that these perfectly designed seats kept us secure whether we sat or stood. I found myself standing literally at the end of my seat for much of the ride. 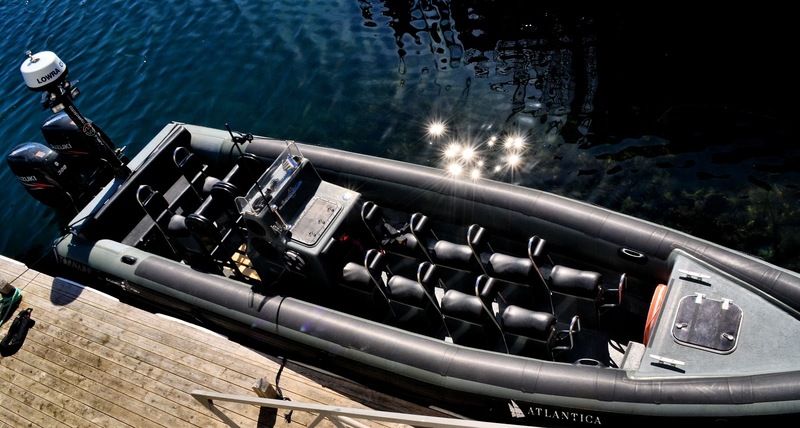 Aerial view of our RIB boat, the Atlantica. Adrenline surged, we cheered as we banked the turns at incredible speeds. At that moment, I think only of Rush's "Red Barcetta" and while this may not be a race car, it was a race nonetheless. "Wind in my hair, … the scented country air, … the blur of the landscape, every nerve aware!" And it was as my surroundings melted away. It was liberating! Now, experience it for yourself! 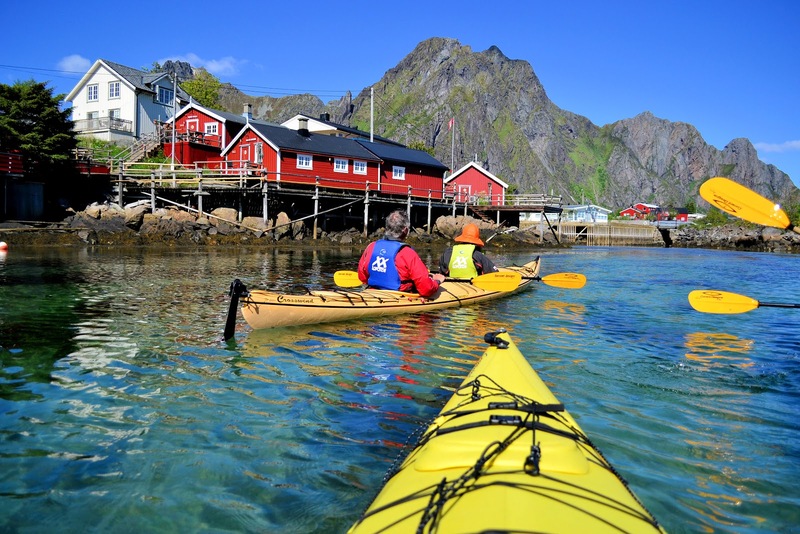 Later in the afternoon, another new adventure, my first-ever kayaking trip with XXLofoten. Once again, we climbed into the proper attire, this time, airtight, rubber suits with pajama booties to keep us completely dry in the unfortunate event of tipping into the fjord. If the watery plunge was imminent, my only thought would be forget me, save my camera! My intrepid guide Miriam from XXLofoten teaches me the ropes of kayaking. Photo: Property of Gøril Vicki Ovesen. Unauthorized use is prohibited. My co-pilot and kayaking expert Miriam explained how to enter into the kayak, sitting down. Well, not actually, but after assuming a seated position, we whooshed right in. Carefully, we maneuvered our way to the open waters and while my trusted guide did most of the hard work, I captured impressions of beautiful Norway that surrounded us on this magnificent day! How am I doing? It's a magnificent day in Svolvær, Norway! Hangin' loose in a barrel roll at the Unstad Arctic Surf School in the Lofoten Islands. 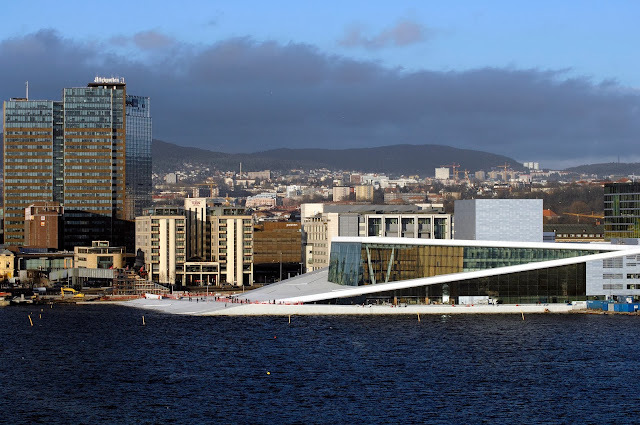 Photo: ©Innovation Norway, Alex Conu and Visitnorway.com. Unauthorized use is prohibited. 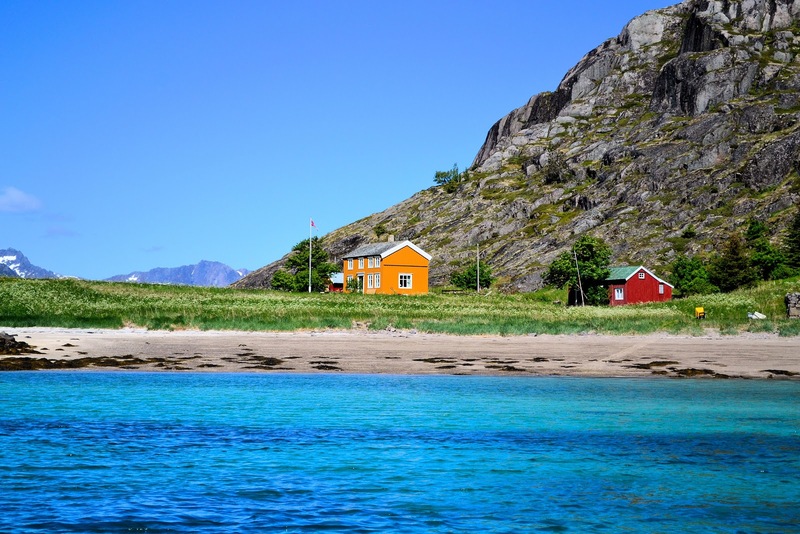 You probably would have never thought of northern Norway as a surfing destintation but a visit to Unstad would convince even the most skeptical! 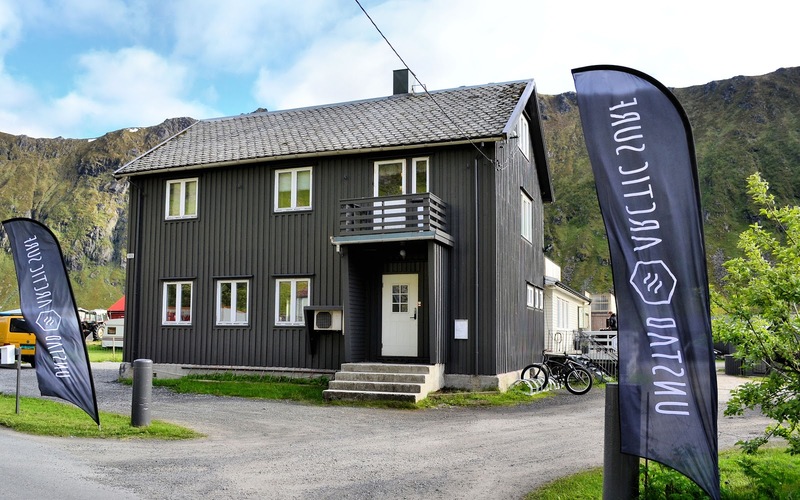 Believe it or not, Unstad, Norway, has been attracting surfers since 1963 and the Unstad Arctic Surf school lying at 68.9 degrees latitude, yes above the Arctic Circle, delivers the goods but not only barrel rolls from September to May but a taste of the local flavors of life. Cowabunga, hangin' ten in Unstad Arctic Surf in Northern Norway. 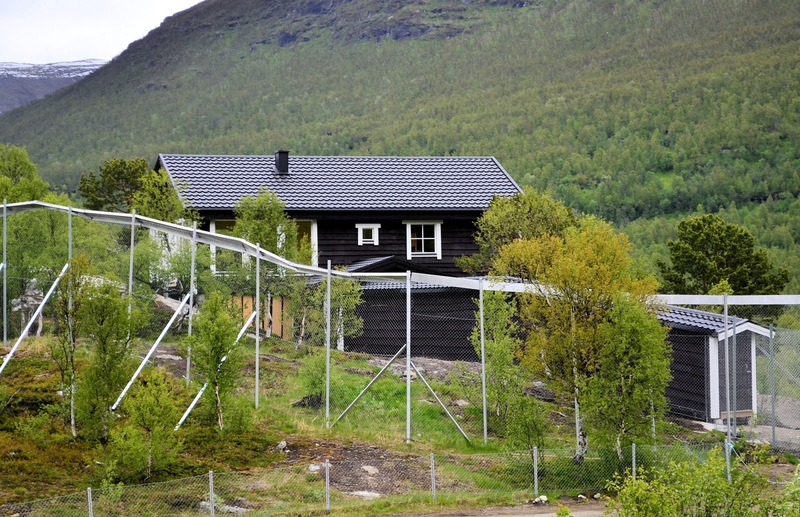 Behind the main house seen here in the background, are a number of cabins accommodating two to 12 guests. These quaint cabins accommodate two. It was a humble beginning in 2003 when Unstad Arctic Surf was nothing more than a camp ground, Unstad Camping, with but a few cabins owned by Thor Frantzen and his wife Randi. Soon thereafter, daughter Marion took over the business with her husband and they settled in this small community of 13 residents with only two surf boards. Today, the Unstad surf school is a robust business specializing in surfing lessons, hiking, camping and more. 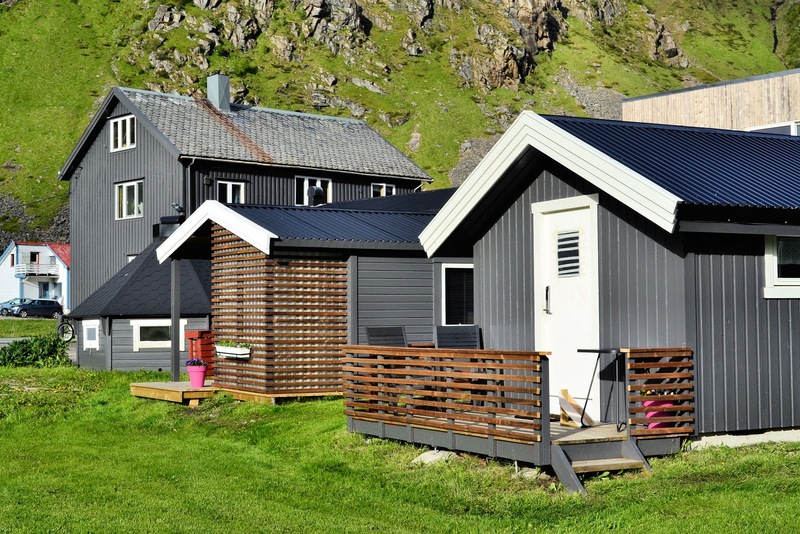 Plus, 54 beds in a variety of cabins with more on the way, and some of the most delicious food served above the Arctic Circle to fuel your insatiable hunger for the surf. By the way and listen up surfers, 50-foot waves are not unusual! 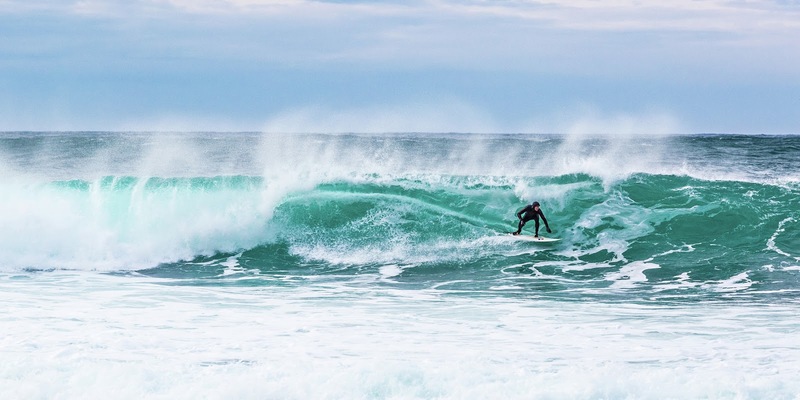 During the regular surfing season from September to May, 50-foot waves are NOT unusual. 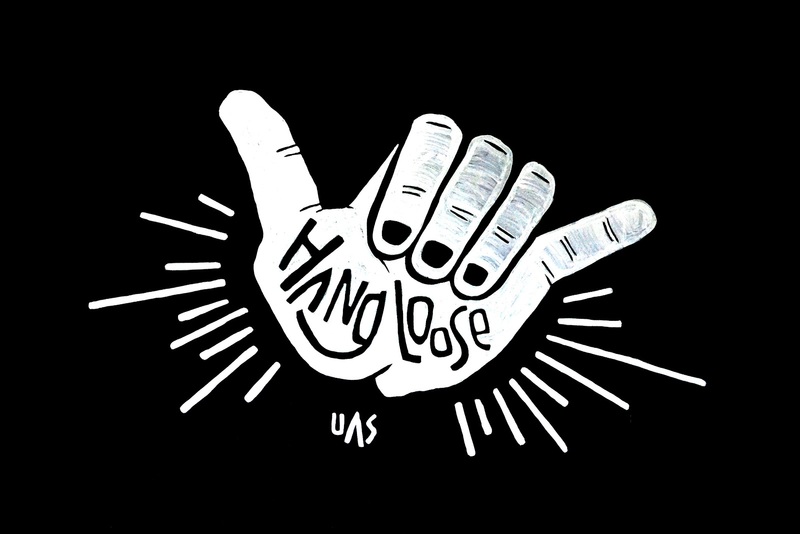 "Hang loose," the philosophy embraced by all who visit the Unstad Arctic Surf School. 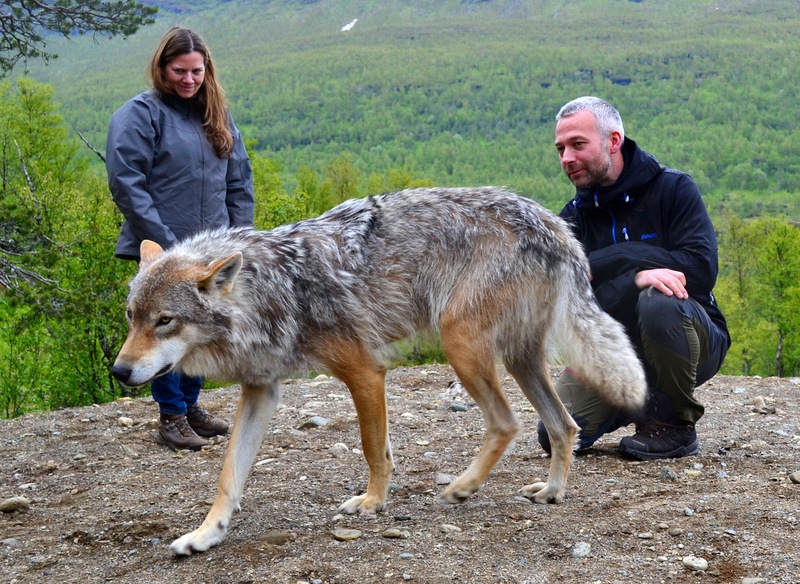 Up close and personal with the wolves at Polar Park Arctic Wildlife Centre in Bardu, Norway. Isn't she a beauty?! Little did I know when we arrived at the Arctic Wildlife Centre or in the Arctic Circle for that matter that I would be French kissing a wolf in the wild; one of the most thrilling yet moving experiences of my life! There we were looking into each other's eyes, and with a gentle kiss to my lips, I knew we were friends. 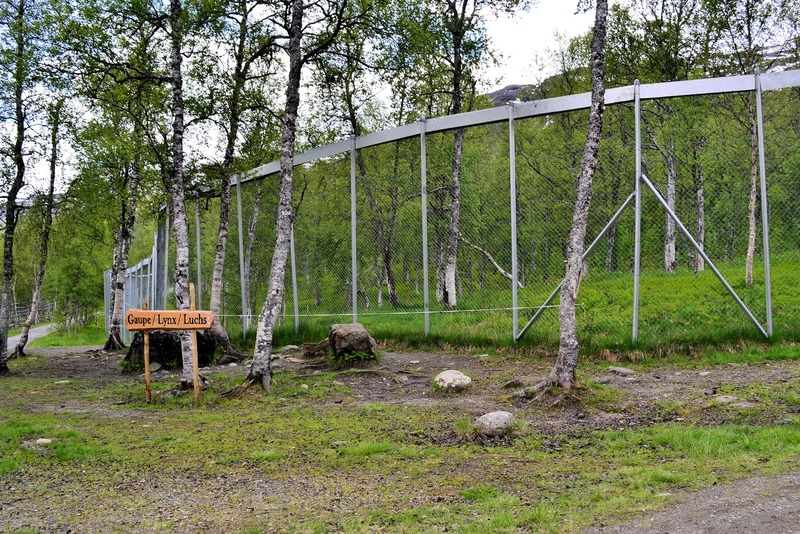 The world's northernmost animal park, Polar Park Arctic Wildlife Center opened in 1994 and covers 275 acres of northern-Norwegian wilderness. Home to large predators as well as their prey, Polar Park is among those parks with the highest ratio of land to animal! 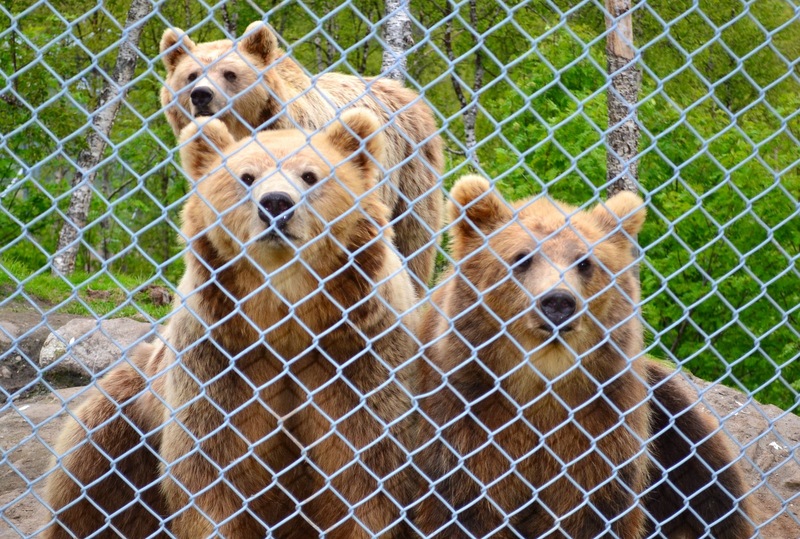 As we walked along, I couldn't help but think of Jurassic Park with towering enclosure fences flanking the roadways trapping us in giant cages; and on the other side, bears, lynx, wolves, foxes, deer, elk roamed freely in their natural habitats. Our intrepid wildlife guide and animal manager, Stig Sletten, shared a secret with us about a new resident that's joining this Arctic woodland community soon—a Siberian Tiger! As we walked through the park, I couldn't help but think of Jurassic Park with its towering enclosures. The resident bears gathered for a family portrait. Here kitty! 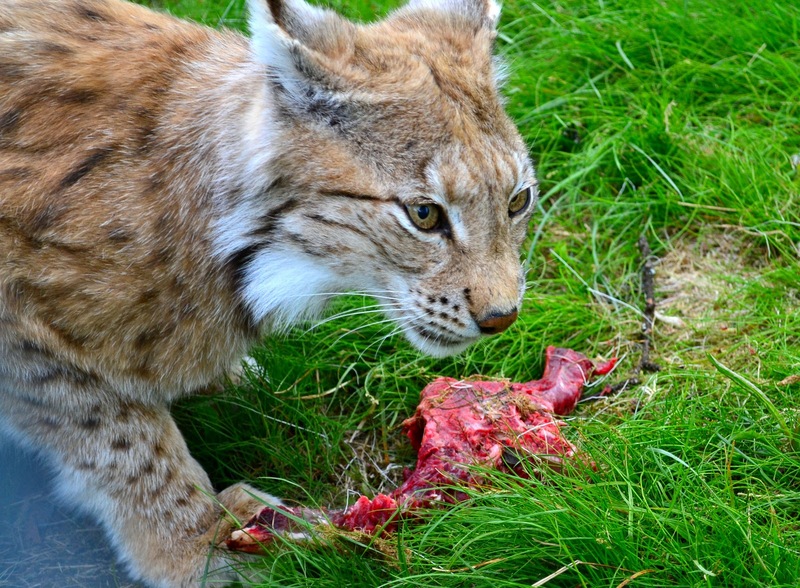 This stunning lynx seemed more interested in his food than us. After our guided tour, it was time to get personal with the wolves but first, a safety briefing that stirred some of that anxiety I've been harboring. Our wolfie rules of engagement taught us protocol and how to posture ourselves once inside the enclosure. After careful examination of our attire by Stig and team, some of us had to remove jewelry and change coats to ensure that it was suitable for our canine encounters. Sadly, one of our colleagues received word that they would not be permitted inside the wolf enclosure because the wolves appeared to be too interested in this person. For the rest of us, we were off. 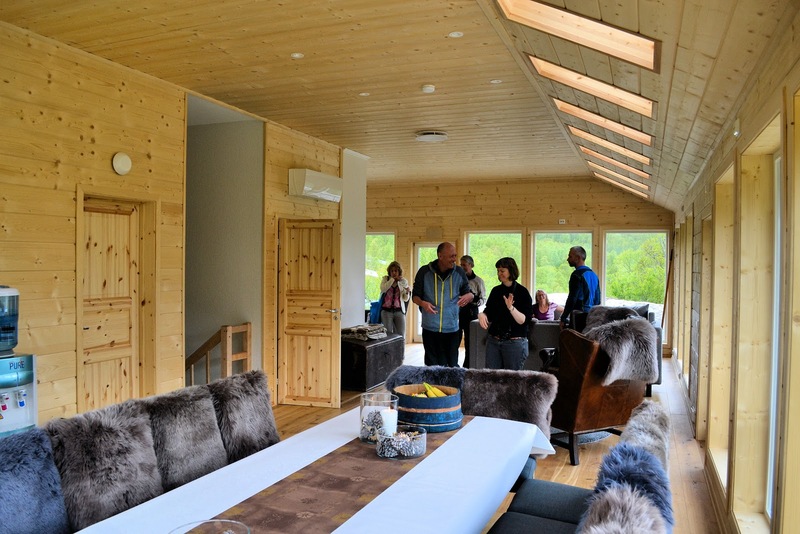 After our tour of the Arctic Wildlife Centre, we made our way to Wolf Lodge inside the wolf enclosure. If you look at the lower right corner, you'll see the tunnel that you have to walk through to reach the lodge. Interior of the Wolf Lodge inside the wolf enclosure. Bedrooms and full bath downstairs while the kitchen, dining and gathering areas are on the second level with floor-to-ceiling windows for peering out into the wilderness. Once inside, and struggling to remember everything Stig just told us, I started to get nervous again. Suddenly, we were surrounded by a pack of wolves, five in total from alpha to last in line for the throne—all hand-reared by Stig and team since birth. We kneeled down and allowed the wolves to approach. Slightly unnerved at this point, one by one, each greeted us with a kiss and suddenly, my fears melted away. If we opened our mouths ever so slightly, in went their tongues to get to know us better and with that, a gentle rub to their tummies, a mutually beneficial exchange. 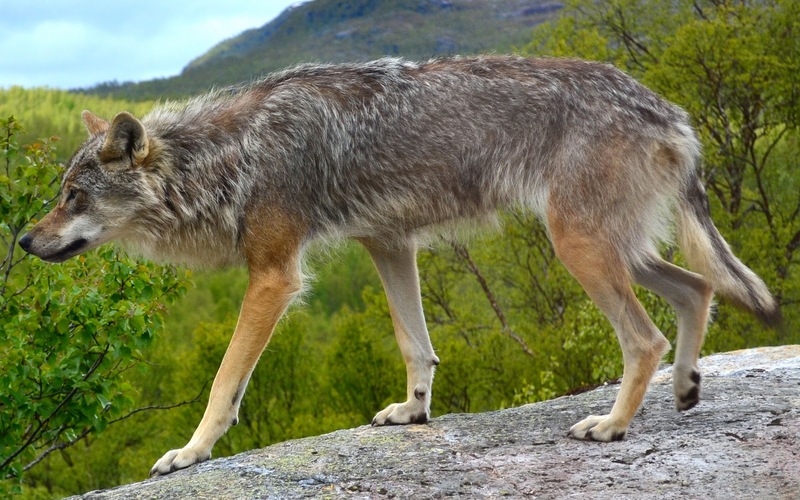 If you're wondering, our wolf comrades had no taste curiously enough, no scent, none whatsoever. My new friend and I getting ready to howl. Picture by @susankime. It's funny, usually it's civilized cultures that I connect with when I travel but this time, it was different—a connection, a bond with wildlife so profound and moving. Near the end of our wolf encounter, Stig howled and suddenly a chorus of howling goodbyes echoed in the Arctic silence. From the first welcome kiss of an Arctic breeze to my last kiss from a wolf, my connections with the people, the landscapes, the wildlife are all a part of me now, an indelible imprint on my ethos forever transforming this traveler from the man I was before I arrived. As I look back, I achieved my goal that I set out to conquer upon my arrival. I hope you enjoyed this taste of adventure above the Arctic Circle! I am extremely grateful to Visit Norway and Northern Norway for opening my eyes and inviting me on this life-changing expedition to the land of the midnight sun! I'll never forget it! Of course, all opinions expressed herein are my own, but I can't speak to an occasional kiss from the wind or a wolf! HI there Jessie! Then my work is done! ;) Thank you so much for your kind words and I think we should go to Norway together. First stop, P.I.E, then onto the land of the Midnight Sun! Oh yes, the camera! LOL! Thanks again! WOW. So much ... wow. Hi there Henry and thanks so much for stopping by and for your kind compliments! Woooooow. I wanted to go to Norway before, but now I REALLY want to go. Absolutely stunning! Hi there Lillie! So glad you enjoyed this post! Isn't Norway absolutely stunning?? Now all you need to do is get there! Thank you so much for stopping by and sharing your thoughts! I've not been to Norway, Jeff, but your post makes me want to visit. I love the idea of "Friluftsliv". Wait! Did you say kissing a wolf? Sounds like a real (and fabulous) adventure! Were you nervous? I remember getting close to a lion during a safari in Zimbabwe - no kissing there! Hi there Marcia and thank you so much for stopping by!! Isn't "friluftsliv" the perfect word for enjoying the great outdoors!! I have an entire article about it coming on TransitionsAbroad.com soon. Be on the lookout for it. 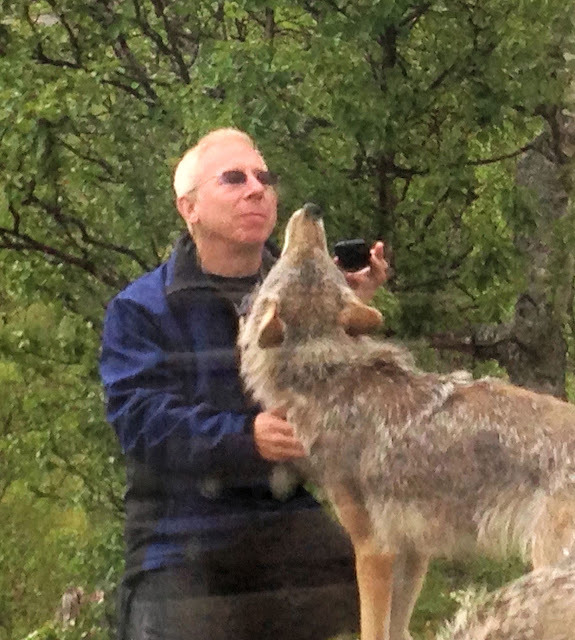 I was nervous at first when we entered the wolf enclosure but as soon as they approached and kissed me, my fears subsided and it was love at first howl! ;) I would have been petrified kissing a lion too!! LOL! Thanks again for your comment! Hi Jeff, I saw your "pinned post" on Twitter and, even though I am a Tropical Travel Girl, I decided to click to read your post. The photos are beautiful and I love wildlife so imagine, if I could stand the cold, I'd enjoy this trip! What were the temperatures you experienced at the time you were traveling? Hi there Debbra and thank you so much for stopping by and for your kind compliments! The temps in summertime varied but I never needed my WINTER parka except for the day we had hail. LOL. You could definitely handle it. Thanks again!